Last Tuesday morning as I arrived at the office bright and early for a meeting first thing my colleagues greeted me with expectant looks and smiles. I was momentarily taken aback; could this mean what I thought it meant? ‘Is it here?’ I squealed. I hadn’t been expecting it until at least midday. They indicated to a package that had been waiting on my chair. It was here. I picked up the package and sat down. As I held it in my hands I paused, holding my breath. This was it; after years of hard work I would finally hold my own book in my hands. The nervous anticipation I’d had for weeks came rushing back to me; the fine line between excitement and sheer terror blurring as it does when your car climbs the rollercoaster track and your knuckles whiten as you get closer to the top before the sharp drop. With heart in mouth I opened the package and pulled out the hardback book inside. I ran my fingers over the cover and read the words ‘A Slice of Cherry Pie’. I beamed. It’s a very wonderful feeling to see and hold your very own book that you’ve worked so hard to write. Books are so very special and I’m still finding it hard to believe that I have my very own, especially one that has been so beautifully designed and produced. The paper feels and smells incredible and the art work is larger than life. This really is a dream come true. I tried not to make my thank you page in the book too long but found it impossible; I’m so very grateful to many, many people. I won’t bore you with repeating the thank yous here save one, and that is for you. If it wasn’t for you, who is reading my blog now and for you has written to me, you who has commented on my posts, you who has been there from the beginning, for all of my readers old and new, and for the friends I have made in the blogging community which I am so proud to belong to, there would be no book. I thank each and every one of you from the bottom of my heart. I have three copies of my book that I’d like to sign for you and give to you as a thank you. If you would like to receive one leave me a comment and tell me what your favourite pie is (you know mine!) and I’ll pick three winners at random. 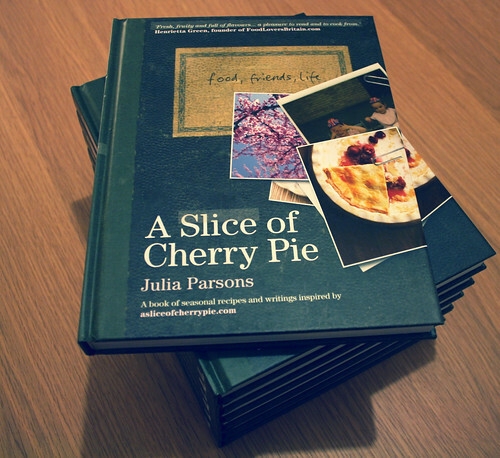 ‘A Slice of Cherry Pie’ is available now, RRP £16.99. Published by Absolute Press. Many, many congratulations! It must feel wonderful. My favourite pie is cheese and potato, although I’m not sure it counts as a pie in the traditional sense! Otherwise I’d say apple. With custard. Does a tart class as a pie?? 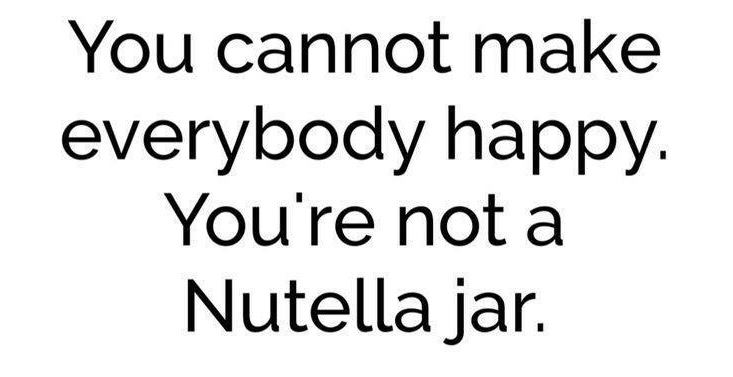 Not sure but in my mind it does…. My favourite pie would be a tarte tartin just out of the oven served with clotted cream. The tarte would be sticky with the scrumptious toffee coating slightly tart British apples and the cream would drizzle down as it melts!! Yum! Fantastic – well done! Looks beautiful, by the way. Wow, so exciting for you! Congratulations!! My favorite pie is cherry pie! Congrats,Julia!An exciting time for you,for sure. Favorite pie?Hmmmmm….I like them all but my first preference would probably be coconut cream. My favorite pie is cushaw pie–it’s a large, pumpkin-like squash, and when made into pie it’s lovely! Congrats, great book, must feel good! My fav pie is a good fishy fishy pie with a potato topping, yum! Good luck to me!!! Looks like a wonderful book, well done. favourite pie, pear pie/ tart. with cream!! Congratulations Julia, it’s great to see all your hard work come to fruition! My favourite pie? Blackberry and apple just like the ones my grandma used to make. Congratulations! I know you are so excited and proud. I would love to have a signed copy! My favorite pie today is Date Cream Pie – my Ganky’s recipe is so lovely! I like pie of all sorts but I am especially craving this one! At last! I had a tear in my eye when you wrote how you rang your fingers over the book for the first time. Congratulations, you must be so proud. I can’t wait to read (and cook from) the book. My favourite pie has to be steak and ale. Yum. It must be such a great feeling to see your hard work come to fruition, congratulations! My favorite pie is peach! Congratulations on your book. My favorite pie is apple pie with lots of custard. A huge congratulations, you must be glowing with pride. What an acheivement, I love new books, the smell the feel, if it was mine I would be on cloud nine. My favourite pie has to be blueberry so glad we have lots of these fruits easily available. I love the oozing deep purple black and the seet full taste. Perfect with vanilla icecream. Thanks for the opportunity to drool over a book by you. Congratualtions, you’re book looks lovely. It must be such a good feeling to see all that hard work come to fruition. My favourite pie? Now that is just too hard. If I had to plump for one it would be mushroom and chestnut – at least at the moment! I’m with you…I love cherry pie! Apple pie with a sharp Cheddar melted on top. Hey Congrats Julia on your new book I know you are excited after waiting so long to officially see it published wishing you the best of success. As for my favorite pie it’s kinda tough one I really enjoyed last year down in Florida was an almond amaretto apricot pie. Hi, Ive just discovered your blog recently. Fab reading-goona try some recipes very soon! cant wait to get your book, its on my wishlist for Christmas! My favourite pie is a spiced pumpkin pie with cinnamon cream on the side! My favourite pie is probably a really good steak and mushroom pie, with shortcrust not puff pastry and a sticky, umami rich gravy within. Mmm! The photography looks stunning. Congrats! Do let us know how you get on! My favourite pie is kidney, roast pepper and mango pie! Congratulations Julia! You must be absolutely thrilled. 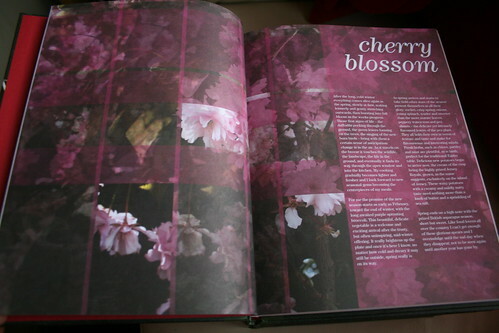 The book looks beautiful. My favourite pie would be a proper Key Lime Pie (no cream or meringue on top) but I’ve always thought that it was actually more of a tart than a pie… So I’ll also plump for a really good fish pie. Really pleased for you. It must have been a lot of work but there’s just something special about hard copy. Congratulations. My favourite pie – a hard choice but probably game pie with plenty of red wine gravy and red cabbage to go with it. Oh my favorite pie is something called Harvest Pie…I buy it at a restaurant by the name of Coco’s. It consists of pumpkin pie as the bottom layer and a pumpkin chiffon layer on top…sounds simple, but sometimes the simplest things are the best things. This is one of those. Congratulations! It looks beautiful- it must feel so wonderful to have it in your hands. Favourite pie: chunky apple with some slivers of dates for extra sweetness. And the pastry has to be short enough to crumble like a forgotten sandcastle at the beach. My favourite pie is blackberry and apple pie, with cinammon and sugar sprinkled on the top crust, served with a nice vanilla icecream. Congratulations, it looks fantastic and I’m sure it must have been such a wonderful moment to have it finally in your hands. I’m torn between sweet and savoury pies …sweet it has to be cherry pie (i know, Snap!) served with vanilla ice-cream and for savoury it has to be Beef in Ale Pie. Congratulations Julia! It looks beautiful and you should be very chuffed indeed. Well done!